Named for Perry Maxwell, one of the unsung golf course architects of his generation, the Maxwell may seem a bit understated, but don't let its diminutive size fool you. With three break stations on each side of the green and a cup-end that elevates, the Maxwell offers up to 50,000 different break combinations to help you practice all the shots that matter most to your overall game. 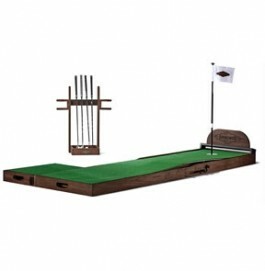 This putting green comes with everything you need to maximize your putting skills including three, 3' x 3' sections, with one cup, one headboard / ball-stop, a side step and a putter rack that holds up to 4 putters*. 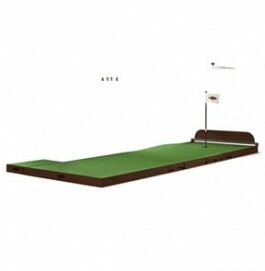 With the Maxwell in your home, you’re going to make precision putting on the course look all too easy. Specs: 3' Wide x 9' Long. Available in Espresso finish.